March is almost gone, but to fill the March sadness void (and also exercise ennui for me), I’m trying yet another new thing. Sam wrote about how the Fit Feminist Team is trying new things, Not to be competitive, but I seem to be in the lead here, with parkour class, aerial silks yoga, and now a 2-hour Qigong workshop I went to on Saturday. Woman leaping with an umbrella in front of a yellow wall. Woman leaping on a beach. bone density, cardiopulmonary effects, physical function, falls and related risk factors, quality of life, self-efficacy, patient-reported outcomes, psychological symptoms, and immune function. Some of the things I liked about these movement patterns were the ways they used my whole body. For some of them I was raising up, lifting my heels, arms in the air, balancing and holding myself up. We did lots of arm movements, which were slow, but involved control, focus, and attention to detail (some of the movements required thought). They also provided opportunities for grace. I loved one movement where we crossed our wrists in front of our navels, began a sequence, and then replaced the wrists to their original position, fluidly and elegantly. Elegance– that’s really what I took away from Qigong. It’s meditative, it’s physical, and it’s elegant in its simplicity and efficiency of movement. Women on a beach doing qigong. Women standing, arms and legs wide, smiling. There are Qigong classes at yoga studios near me. I will be checking them out. Will this new form of movement become a regular part of my rotation? It’s too soon to say. But I’m intrigued on multiple fronts. Have you or do you do Qigong (or Tai Chi)? What do you think? What does it do for you, and for your other forms of physical activity? I’d love to hear from you, dear readers. I went to see Captain Marvel on the weekend with my family. I enjoyed it very much. The characters were nicely developed; the story line was engaging; the writing was clever. The hero was not hyper-sexualized and there was no love story. As much as I liked Wonder Woman, I was more than ready for an action movie featuring a woman in a central role that did not require a skimpy outfit. Captain Marvel is a woman who thinks for herself and seeks solutions. When she ends up stranded on earth, she figures out how she is going to communicate with her team. She’s not afraid of hard work nor is she afraid of training hard. Her fitness and strength are tools she uses to defeat her opponents while outsmarting them. Like many noble warrior heroes, Marvel is challenged to find her true self. Her memory has been fragmented, but over time, the bits she has retrieved form a story. There are three pivotal moments for me in the film and they all come pretty closely together in the final quarter of the film. The first is when Vers remembers her real name, the second when she comes into her full powers, and the third when Carol quashes her former mentor’s ego. These three moments have a lot to offer women in pursuit of fitness, strength and power in the gym. When Vers remembers who she is, she rejects the name she was given and asserts her real name. “My name is Carol,” and she pushes back with all her strength. Women are often told they shouldn’t lift weights; that working with the bar will change their essential nature, that they will change shape and not in a good way. I’ve learned that when I walk into the gym and assume my role as power-lifter, that when I accept I am there to lift all the heavy things, then the dynamic between the bar and me is quite different. When Carol thinks and reflects on what she is hearing, she is able to reframe what she knows. She’s been convinced for too long that she has no power except for what her oppressors have allowed her to express. She remembers all the times she fell down, the times she was taunted and told she could not do what she planned, the times she was scolded for having dreams that were too big for “normal.” Most importantly, Carol remembers all the times she got back up. When I am at the gym, I remember all the times I got back up even though I didn’t want to. My trainer even has “Always stand up” taped to the squat cage. This winter has been hard with extra cold weather and a cranky hip. It’s surprising what strength you can find when you say those three little words. Finally, Carol takes joy in her strength and power. She revels in what she can do — defeat bad guys, look after the good guys, and organize a plan to make change happen for the people she helps. When the bad guy tries to take credit for her skill and power, Carol tells him she has nothing to prove to him. Indeed, if there is one thing you take away from this post (and the movie), is that the only person to whom you must be accountable is yourself. You show up, do the work, and get on with the job at hand. How about you? Do you find inspiration from action movies? — MarthaFitAt55 lives in St. John’s. Sexual abuse is obviously a feminist issue. It’s actually something I write about in my day job as a feminist philosopher. But given that philosophy is my professional training, not journalism, I’m going to leave discussion of the details of individual cases to people who report such things for a living. Instead, I want to do something a bit different, and think about the background conditions and relationships that make abusive situations possible. To help me do that, I’m going to have several conversations with people who have had a variety of experiences with taekwondo coaching and competition. That’s not because I think it’s more important than other cases, but it’s my sport, and I feel much better positioned to talk about it. But just so you know, I’m not going to ask anyone to weigh in on particular cases, individuals or allegations. It’s just that in order to get a better understanding of the stakes and context of some of these cases, I think it’s important to understand the nature of the relationships in question. So just keep an eye out for an occasional series with me and guest views. I’m going to talk to people about their gendered experiences in sports, as well as their views about power and mentorship, and how it works in these kinds of contexts. A coach, after all, will get you to do a lot of things you don’t want to do. They’ll get you to push through a hard training session when you’re tired or don’t feel like working out. And over time, you’ll do a lot of things that might feel counterintuitive because you trust them to know what’s best for you – sometimes more than you trust yourself. Make that happen in the context of a sport whose traditional roots value discipline and deference to authority, and it seems as though the potential for abuse is high. Also, I think that a lot of people who haven’t been competitive athletes can easily underestimate the power that someone highly positioned in the sport can have over you – especially when you’re still young and trying to find your place. So hopefully one thing that we’ll get out of these conversations are some useful ideas about how to understand power and relationships better, so we can work to make ourselves better and improve the situation of future generations of athletes. I recently decided to delay taking my 3rd degree black belt test. It is really hard for me to back down (or at least sidestep) an important plan I had made for myself – especially when there is a established timeline to follow. However, as Master D reminded me this week, for black belt testing the suggested timeline is a minimum, not a maximum. With that in mind, taking an extra 6-8 months (depending on scheduling) is not a big deal. My wrist, broken or not, has been troublesome. Even though I practiced in a modified way while my wrist was in a brace, the restrictions on my movements prevented me from learning the flow of my new patterns. I order to maintain my balance, I wasn’t even supposed to do any kicking while I had my brace on. Since ‘TaeKwonDo’ essentially means ‘the art of kicking and punching’, you can imagine how much of my patterns I had to just make a mental note for instead of doing the movement. This video is of someone demonstrating ‘Juche’ one of my newest patterns. Imagine trying to learn this without being able to move your right hand, and without being able to kick or jump. It was tricky, to say the least. Also, I wasn’t expecting that my movements would still be somewhat restricted when my brace came off. I had sort of thought I could throw myself back into everything once I was brace-free. Instead, I had to take a break from sparring, or any movements where my wrist might strike something. So, I have spent the past three months being extremely conscious of every movement, which puts me in the overthinking zone. That’s not a good place for me to learn effectively and definitely not a good place for me to build confidence in my movements. My time has not felt like my own. In the past few months, I have had a variety of new obligations – a new freelance gig, some family-related things, and some time-consuming volunteer work- that have resulted in a new schedule every week. All of those things have been fun and worthwhile, but the changing schedules have wreaked havoc on my ADHD brain. My sense of time has gone right out the window. 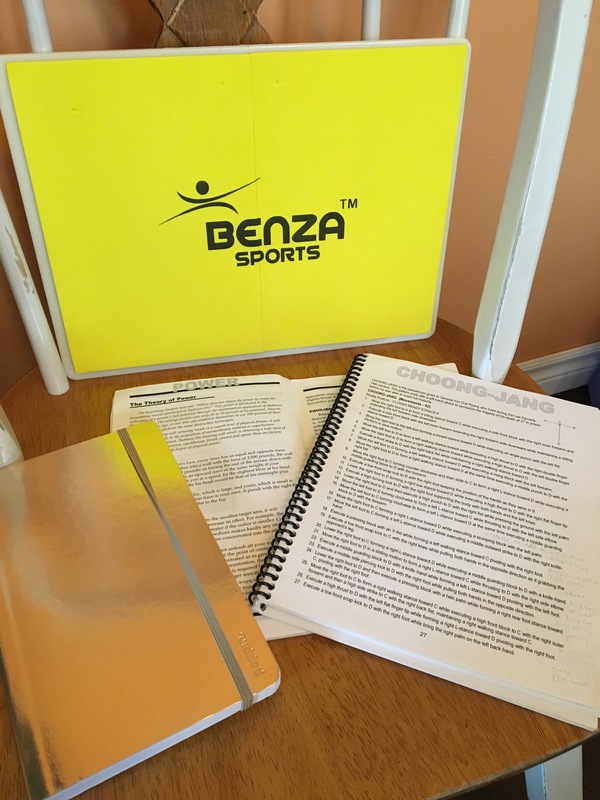 That means that I haven’t always had the focus I needed for the other aspects of test preparation – studying theory, ensuring that I understood the purpose and methods behind the movements, and practicing my board breaks. It’s not that I didn’t have the time to do those things, it’s that my perception of my time has been inaccurate. My heart was not in it. Normally, the time before a belt test is nerve-wracking, but exciting. Even when the work ahead of me has been hard, I still felt drawn to it. This time, it felt like I was preparing to test just for the sake of taking the test. It seemed like I was doing it because I said I would. That’s not how I want to approach my tests. I want them to feel like a challenge, not a chore. I want to feel up to the challenge, I want to feel ready for the work. Instead, I just felt kind of tired. I knew that I *could* do the work in time, but I didn’t feel like I wanted to. And I didn’t feel prepared to sacrifice other things to make more room for the extra work I needed to do. It was my own attitude that made me decide that I didn’t want to test in June. I wasn’t in the right headspace for meeting a challenge. I wasn’t feeling any joy in the process. Once I had acknowledged where I was, I began thinking about what it would be like to test at another time. That’s when I realized that delaying my test meant I would have all summer to practice (I love practicing outside) and I would get to train and test with some of the highest ranking students in my school. Something clicked for me then. Some of my resources for the next six months – my theory book, my patterns book, my shiny gold notebook for recording my training notes, and my rebreakable board for practicing. I felt excited about that future testing. I felt a power in the idea of training with that group, of being challenged to match their skill levels. I could see the next six months or so laid out in front of me, training in one area and then another. It didn’t feel like I had to know everything at once. And it wasn’t just that the time had expanded that gave me that feeling, it was knowing who would be with me on that journey. I could clearly imagine that test day and I smiled at the thought. And since I made that decision, every exercise I have done has a type of ease in it. *Just to be clear, even if I had decided that I was ready, my instructors have the final word. I don’t know what their final word would have been but I know they were concerned about whether I was ready. At UFC 224 on Saturday, bantamweight champion Amanda Nunes defended her title yet again, this time against Raquel Pennington, whose biggest claim to fame was probably a decisive victory over her former Ultimate Fighter coach Miesha Tate in 2016. Pennington was clearly the underdog going into Saturday’s fight, and, while she remained in the game until her TKO in the fifth round, Nunes was obviously dominant. Nunes (left) throws a punch at Pennington (right) during Saturday’s UFC 224. The controversy here came when, after taking some extremely effective knees during the fourth round, probably breaking her nose, Pennington told her corner that she wanted to be done. Instead of throwing in the towel, her corner told her to push through and throw everything she had at the match. While she stayed active through the beginning of the round, some strikes midway through reopened her bloodied nose. After she went to her knees, the referee stopped the match, giving the TKO victory to Nunes. The MMA world is extremely divided over the corner’s decision to put Pennington back in the cage. Nunes, Pennington’s opponent, but also her friend, spoke out against the decision, saying that her coach had failed her. On the other hand, Miesha Tate (who has fought both of them) defended the corner, saying that it had allowed Pennington to lose with dignity. Pennington’s fiancee Tecia Torres, said more recently that both of them agreed with the corner’s choice as well. I admit that I, personally, feel some force from both sides of the debate. As a former athlete, I can appreciate being pushed not to quit, even when I might want to. But as a current coach, I don’t think I would be able to send an athlete back out if they really wanted to quit and were at risk of being seriously injured. Now, I don’t coach at nearly these levels, so that makes a difference. But in my experience, an athlete who doesn’t want to fight any more is at serious risk of being hurt or knocked out. One thing I haven’t seen talked about that much, though, are the gender dynamics of what happened. Now, it is not at all unusual for fighters to be injured in the course of a match, and for decisions to be made about whether or not they can continue. Nor would it be the first time in which a fighter or coach has wanted a fight to be stopped midway through in order to concede. And I genuinely appreciate how well the UFC handles having a women’s division, without excessively sexualizing or patronizing the athletes, and with women headliners being a typical occurrence. But I think that bloodied and bruised women affect us more than bloodied and bruised men. I also think we are much more likely to automatically frame injured women as victims. So I wonder how much that gender dynamic and the idea that we need to protect women (even from other women) shapes the discussion of whether Pennington’s corner should have stopped the fight. Noticing that the discussion might be gendered doesn’t really tell us what should have been done, though. Maybe as a sport, MMA needs to do a better job of protecting athletes, even from themselves. There are plenty of long time veteran fighters still active in competition who might be at risk of serious brain damage from knockouts. Maybe if we notice that our protective inclinations kick in more when we see women with bloodied faces, we should wonder why we don’t feel more protective of men in similar conditions. It should be obvious at this point that I’m very much in favour of women competing in traditionally masculine sports, like combat sports. But maybe one side effect of that could be to question some of the taken-for-granted aspects of masculinity associated with these sports, and whether they’re really good for anyone. Persevering is good, but likely not when it causes major bodily harm. Do we want to treat going out on your shield (so to speak) as virtuous? My first moments of wrist freedom. Obviously, that was a good sign. I don’t need physio, I can drive and do just about anything I want to, my only restriction is that I can’t do contact sports for another few months. My wrist aches and my hand swells from time to time, but that’s all part of the process. I am just easing back into my regular activities and taking it easy when I need to. I have almost full range of motion and I am doing anything I can to get the rest back. I can feel that it is a muscle/ligament issue at this point, rather than any damage per se. It feels like the kind of stiffness that happens after over-strenuous exercise rather than a warning not to move. Perhaps a better way to put it would be to say that the discomfort I feel when I move my wrist in certain ways is annoying but it doesn’t cause me any distress. When I first injured it, my internal distress was a real signal for me that this was a serious issue. 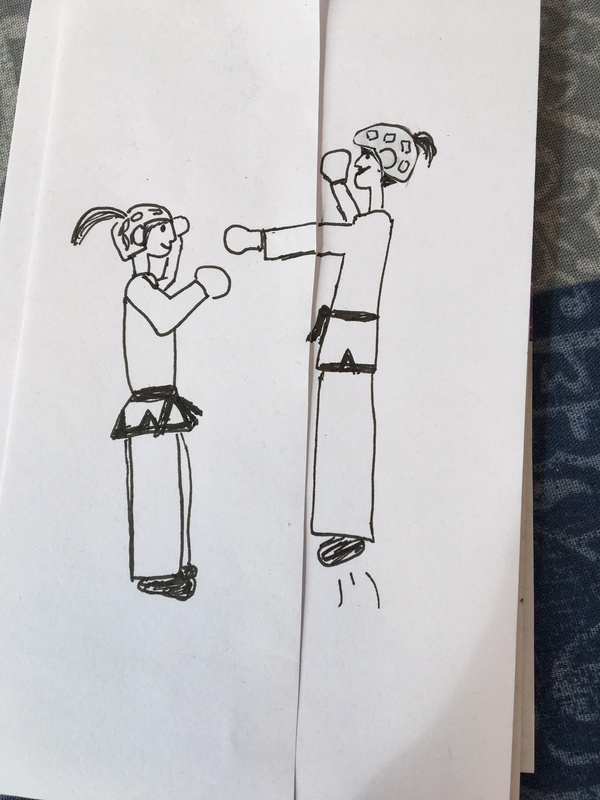 When I couldn’t *do* TKD, I did some related drawings. Personally, I think the drawing/writing/typing I did while my hand was in the brace helped with my recovery. 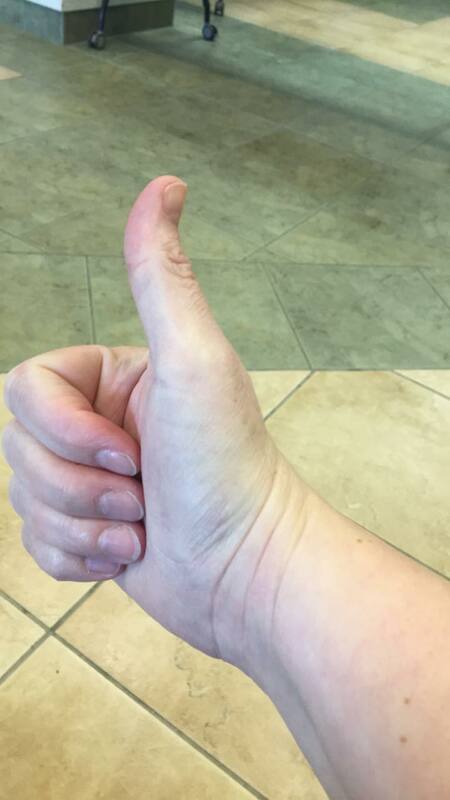 The short version: I didn’t do as much exercise as I had hoped I would. The longer version: I kept going to TKD and I did as much as I could to learn my new patterns and do some strength training. I couldn’t easily go for walks because the paths and roads around my house were snow and ice covered and felt really risky. Things like dancing or using my old aerobics step usually resulted in too much arm movement and caused me discomfort or pain. I did some yoga but I couldn’t do most of my favourite poses because my brace felt heavy with my arm extended and because I couldn’t rest any weight on my arm/hand. And, mostly, the effort of getting through my day with one hand, with the weight of the brace and the position of my wrist, just made me extra tired. And accommodating the brace made me move my right shoulder differently which caused me tension in my upper back that was hard to stretch out. Since my brace has been off, I have been doing all kinds of bits and pieces of exercise. A little yoga, some walking, some body weight exercises and the like. I’m finding TKD a little strange, even six weeks without jumping and turning makes for some uncertainty. I feel unsure of my capacity and nervous about my balance but I think that my confidence will return with practice. My TKD instructor, Master D, has told me that it is likely I can still test for my 3rd degree belt in June. However, I have to do my hand-technique board breaking with my left hand. That is going to make things interesting. The technique I am using is new to me (a jumping double punch – two boards one after another to be broken with one hand) and I was a bit uncertain about it with my right hand. Using my left adds a different element. However, I wonder if my lowered expectations for my non-dominant side will actually help me not to overthink the process. I guess practice will tell! *This led to a tangle of fitness bewilderment but I’ll get into that in a separate post soon.